Predictions are only worth so much. With a star-studded leaderboard, the announcers were discussing possible outcomes from Sunday’s play. While Sergio Garcia and Justin Rose, in the final group were serious contenders, most of the talk was about Jordan Spieth and Rickie Fowler in the next to last pairing. The analysts expected great things from these 2 young guns as each was on a roll and playing well. Sergio on the other hand, was playing in his 61st major and had never won. Justin Rose, with a seriously strong pedigree was given due respect as a possible green jacket winner as were several others in the field. Again, most of the talk was about how Jordan and Rickie were primed to make runs at the title. Perhaps you know the results. Sergio beat Justin on the 1st playoff hole. Jordan shot 75. Rickie shot 76. So much for predictions! Sir Nick hasn’t seen everything. When Russell Henley jarred-holed out his 185-yard approach shot on #5 for an eagle it was a flag-rattling sight. The ball entered the cup on the fly, no bounces. Yes, this has been seen many times previously by all of us. The ball, however, upon entering the hole, actually damaged some turf around the edge of the hole and broke off a piece of the cup, rendering it in need of repair, and of the course, the turf needed to be fixed as well. By rule, a player cannot do these tasks. They must be done by course staff under the auspices of rules officials. So, staff were quickly brought in, the broken tin cup was removed, the turf repaired and a new cup was cut, by rule within the proper distance from the original cup and play was resumed. Sir Nick commented that in all his time around golf and golf tournaments, he had never seen this situation. Very fascinating and interesting stuff! A very young fan can take home a once-in-a-lifetime memory from The Masters. Matt Kuchar got on a roll on the back 9. On the par 3 16th, he stepped up and hit a 7-iron. The shot looked good in the air, but Matt could only see the flag, not the cup, from the tee box. The thundering roar of the crowd told him his shot had gone in for an ace. What a thrill for all the fans and, of course, Matt. But the biggest thrill, at least for 1 little fan, was yet to come. Kuchar walked up, acknowledged the crowd, pulled his ball from the cup, wiped it off and signed it. As he exited the green he handed the ball to 1 of the youngest golf fans in sight. How old was he? Don’t know but he obviously knew something about golf because he was absolutely elated when Kuchar handed him the autographed ball. What a beautiful gesture by a true gentleman and he gave that boy a treasured memory! That’s what our sport is about! Be sure to check out the link above, it’s worth it! There were so many special moments yesterday, there is no way to do them justice here, so let’s wrap up and congratulate Sergio on a great victory! “Golf Happens”, a phrase used to describe an extraordinary happening during a round of golf. Certainly it can be used in a positive reference as for instance, Linda, S3 and I witnessed our 2nd Double Eagle during a college tournament last Monday. Linda and I were parked at #18 green, a par 5 easily reachable in 2 shots for these talented young men. One of S3’s playing partners, Javier, hit his 2nd shot, it landed just left of the center of the green and rolled straight down a ridge and entered the middle of the cup at the perfect speed. What a thrill! And Javier, not quite able to see the hole, learned about his great shot by osmosis. So in this case, in a positive vain, “Golf Happened”. It was an unexpected and unusual occurrence. Let’s give Danny Willett some credit as 5-under during the final round at Augusta is a great score, but he had to be as shocked, although likely a bit more pleasantly shocked than everybody else, as he watched Jordan’s performance on the back 9. Danny was in the right place at the right time. Make no mistake, this 5-shot lead and tournament was Jordan’s to lose and he did. There may be a bunch of folks trying to get into the intricacies of what happened to Jordan’s mental state, or lack of, during this time and I’ll leave that to the pros. As a parent I can tell you that he basically lost his confidence, his trust in his swing. When that happens to S3, sometimes with irons/approach shots, his ball ends up short and right. Sound familiar? So as we ask ourselves, how does Jordan, after making 4 birdies in a row on holes 6-9, totally lose it on the next 9 holes? Dad and Mom please get this, golf is a tough sport and the mental part is 90% of the game. As tough as the pros are mentally, they are still subject to the frailties of the human mind. And your junior golfer is even more mentally fragile. 1 poor shot may throw your son off his game. The winning part and the toughest part is how quickly can he forget that poor shot and hit a great shot? Your boy might get mad and anger always wins and he may carry that emotion for several holes, which he will probably play poorly, enough to ruin his round, before recovering and starting to play well again. The pros get mad, yes they do, but they deal with it better than the rest of us. Always encourage your junior golfer, especially after a poor shot or a 3-putt. A big smile, yes 1 he can see and a strong thumb’s up are all he needs! We want the positive “Golf Happens”! Junior Golf : Are You Watching? Happy Friday Flop Shot to you as Linda and I ask, are you watching, as in are you watching The Masters, the PGA men’s 1st major tournament which ends Sunday? Tee shots on the 1st hole of any golf tournament can be nerve-wracking, but even 6-time Masters winner Jack Nicklaus admitted that his 1st shot at Augusta was always intimidating. Why is it so? The consensus seems to be that players just want so much to win The Masters as many regard it as the holy grail of all golf tournaments. Yesterday had a couple of difficult moments, those where your daughter can see that crazy things happen to every golfer, even the best players in the world. Ernie Els, legendary nice guy, make that great guy, 7-putted #1. Folks, in all the junior and college golf that I have personally watched, a 5-putt is the most I can recall. S3 has had 1 4-putt and those dreaded 3-putts are something all golfers want to eliminate. Having a round with no 3-putts is always a goal. Ernie finished with an 80, 8 over par, playing his last 17 holes in 2-over, not bad. There is a cut after today’s round so everyone will be focusing on playing well enough to play on the weekend. There are a few previous winners flirting with that cut line so they’ll need to step it up today. Jordan Spieth played a beautiful round yesterday shooting a leading score of 66, 6 under par. It was a very breezy day Thursday, but as Sir Nick Faldo said, “Jordan played like there was no wind at all, putting his shots in the right places”. And as Sir Nick, 3-time Masters winner also stated, “Augusta National is all about putting your shots in the correct positions. Just being a few feet off in the wrong direction can leave you no real chance to hit a good next shot”. This is because this is cumulative in a way. In other words, if the tee shot is out of position, then it is difficult, if not impossible, to put your next shot in position, and it continues and players are struggling to 2-putt or make dicey up-and-downs. Shot placement, where you want your ball to end up, stop rolling, is always important. 1st and foremost, record the golf and the related talk shows like the Golf Channel’s Live From The Masters which airs all week long from Augusta National Golf Club. These “Live From” shows are great with amazing interviews and insights that your son can’t get anywhere else. If you don’t have a TiVo or some sort of recorder for your tv, please consider adding 1 to your tv provider package. Yes, I know it’s extra money, but if you and your son are serious about junior golf, this should be part of your budget. And yes, you need to get a tv package that includes The Golf Channel. We have used DirecTV for years and they are a superior provider. For the majors they air extra broadcast channels and for The Masters it’s channels 701-705, showing featured holes, featured groups, etc., great stuff! ESPN, DirecTV channel 206, airs the tournament on Thursday and Friday starting at 2:00pm central time. Then CBS, DirecTV channel 5 here in San Antonio, airs it Saturday and Sunday also starting at 2:00pm central time. For Sunday, the final round, always records at least 2 hours extra after the end of scheduled broadcast time to capture any playoffs or just overrunning of time. This happens more often than you would expect. Future Champions Golf in California is offering some discounts for event sign-ups when you do it through April 10, relating to The Masters. 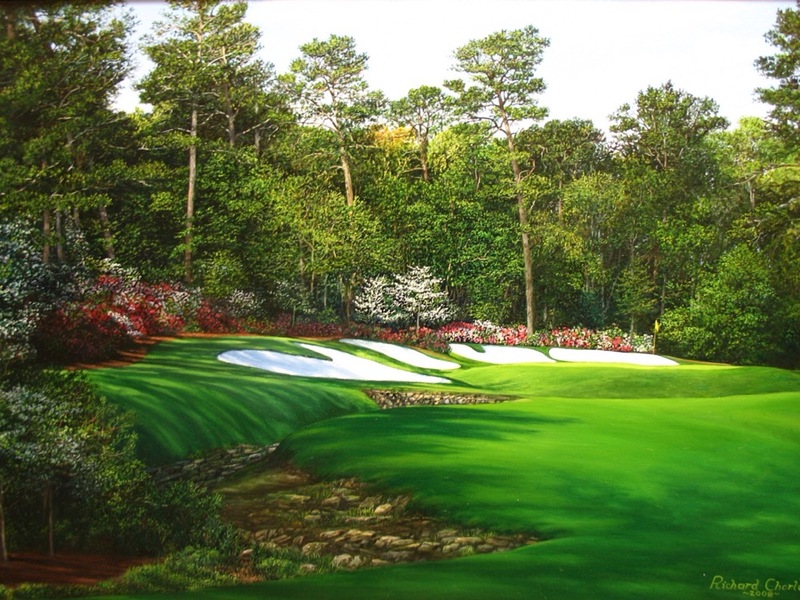 Big golf retailer Golfsmith is having a Par 3 Sale relating to the famous Masters Par 3 event. GolfNow also is using Masters references in their ads and emails promoting their discounted green fees. Masters mania is everywhere this week and you might take advantage of some of these specials and save a few bucks. Enjoy!